Here at Rhine Valley Game Calls we try and stock an assortment of different types of "Soft" Trout Baits. We carry some of the most popular brands for our area. As always, if you don't see what you use, we will be happy to order the product in for you. Berkley PowerBait (Yellow) Trout Bait. Berkley PowerBait (Salmon Peach - Salmon Egg) Trout Bait. Berkley PowerBait (Red/White/Blue) Trout Bait. Berkley PowerBait (Chartreuse) Nuggets Trout Bait. Berkley PowerBait (Rainbow) Trout Bait. 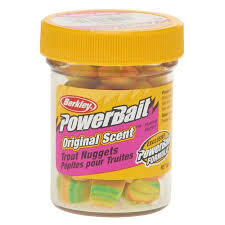 Berkley PowerBait (Rainbow) Nuggets Trout Bait. Berkley PowerBait (Cheese Formula) Trout Bait. Berkley PowerBait (Orange Chroma-Glow) Trout Bait. Berkley PowerBait (White Glitter) Trout Bait. Berkley PowerBait (Corn Yellow) Trout Bait. Berkley "Gulp" PowerBait (Orange Pulp) Trout Bait. Pautzke's Balls-Of-Fire (Premium) Salmon Eggs.